Hello humans. Here’s an update. I knew I needed to add this at some point so I went ahead and did it. This enables the game to recycle objects instead of constantly buying new ones and then throwing them away right after. This means better performance during game play. People often call this “object pooling” but I decided just now that I’ll call it recycling. So if an enemy is shooting a ton of bullets the game will only create enough as it needs to show them all on screen at once. As soon as a bullet isn’t needed anymore (it hits a wall or flies to far away), it will be hidden (not destroyed) and prepared to be shot out of the gun again. I coded another enemy using the AI system I wrote the other month. This is the illustrious Whicket. They’re a tribe of sassy tree folk who live in the swamp. They wear tastefully carved masks. Well it’s more of a hollowed out log that they wear, over their whole body. Anyway those little red berry bullets are recycled. That little bit of spit that flies out the end of its blowgun is recycled. That’s cool right. I ended up making some big simplifications to the AI system that also make it more flexible. Pretty happy about it. Below is a shot of the colliders used to trigger different behaviors. The box in front is the “Ima shoot at you” box and the one behind is the “did I just hear something behind me box?”. These colliders are references by “ObjectDetected” scripts that are used to transition states. I call a state a “conduct” in code. State = behavior = conduct. And here’s a shot of the prefab hierarchy for this little guy. As you can see I’ve decided to be pretty liberal with my use of game objects as organizational tools. Some of this hierarchy is required by design, but other parts are strictly for the human (me) who’s trying to keep everything understandable (by me). The ShootAttackZone and InvestigateZone are game objects that host the colliders mentioned above. The Conducts object and its children represent the brain of the enemy. The ConductController component, which is hosted in the Conducts object, makes sure the correct conduct object is enabled and all others are disabled. Here you can see the Wander, ShootAttack, and Stunned conducts. Let me grab a screenshot of the Wander object for you. There it is. So this ^ is a Conduct object. When this conduct becomes the active one, an animator trigger is set to start the walk animation, the “simple walk behavior” is started, and a conduct transition is enable called ChangeConductOnObjectDetected. You just give this transition the a collider, a layermask, and a target conduct to transition to. We add a separate transition that checks the InvestigateZone and that will target the Investigate conduct (that’s not on this object for now). Anyway I plan on putting this code up on GitHub in case anyone is interested in it. I want to make a more detailed post about this later. Zach, the composer for Glace, is building up his refreshed versions of the music tracks. They sound great of course. You’ll definitely recognize the music. It hasn’t changed such that you’ll miss the original tracks. These are the same songs but with extra polish and some more variation. We’re giving FMOD a shot. Haven’t integrated it into Unity yet but I’m looking forward to it. I also grabbed a really great sound effects pack that will fit in great with the game. The overworld and stages are on speaking terms now. You can exit a level at a gate stone and appear at a specific place on the overworld. You can go to a landmark on the overworld map and enter the stage for it and appear at the right place in the stage. I’m happy with how it’s turning out but lots more work to do. I’m working on a smarter camera and an improved background system with parallax features and what not. I’m mostly just really excited to show you this game. I think you’re going to love it. More updates to come. Hello! The last week I’ve been working on transitioning gracefully between scenes in the Glace remake. I’m using Unity, so the word “Scene” here is a proper noun. I didn’t have much experience with this so got to learn some new stuff. There are some common challenges regarding all this. One being that when you load a new scene, Unity tears down your current scene in some non deterministic fashion. Unity just starts disabling and destroying components and game objects seemingly at random. This is basically the same way Unity works at scene creation, so it’s not a new paradigm, but it’s easy for me to forget. Even after a component is up and running nicely, you still can’t assume that its dependencies will be around in the future. Another issue is synchronizing services between scenes. I’m doing my best to minimize the state that sticks around between scene loads. I’m heeding the warnings of my predecessors about the dangers of having scenes that know anything about the scenes that came before them. Basically if you have a scene that requires other scenes to be loaded before it you will be sad and your turtle will be disappointed in you. So none of my services even stick around between scenes. They all get torn down and then recreated if they’re needed in the next scene. Any state I want to keep is handled by configuration assets AKA ScriptableObjects. Let’s see what else? Well one of the things that a scene passes to the next scene (through those config assets) is at which spawn point the turtle should appear in the next scene. This way when you warp out of a stage you’ll appear where you expect on the overworld. This let’s me do some interesting linking between stages and the overworld too. At some point I’d like to experiment with using stages as a way to move around the overworld. For example on the overworld you would go into the entrance of a cave. You’d enter a spooky cave stage with turtles in it. You’d get through the cave stage and when you exit at the other end, you’d appear on the other side of the mountain on the overworld. On a beach. The only way you can get to this super secret turtle beach is through this turtle cave. Maybe you’d unlock a turtle gate stone at the beach so you can turtle back without having to turtle through the turtle again. Or turtle not, but I always turtle off fast turtle on all the games I turtle. Who knows. Ok more work to do. Thanks for reading. Ooh look at the gate stones being activated. They act as spawn points. Just wanted to post a new GIF real quick. 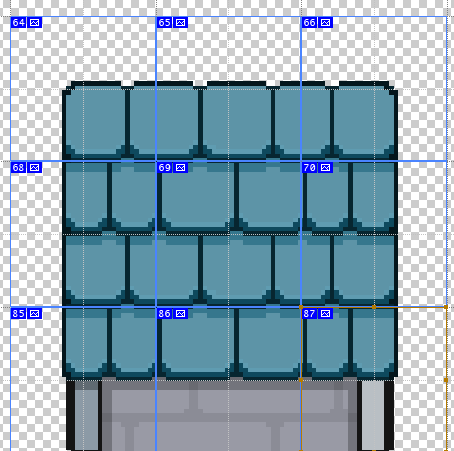 This shows a rough cut of some overworld tiles with Glace sized down to something closer to what he’ll be in the finished game. Lots of room for improvement but things are starting to come together. Next I’m adding some points of interest to the overworld that act as entry points into stages. Hi friends. I finished the gate stone UI that’s used to warp out of levels. This lead me to get started on the first bits of the new overworld. I’m excited to build this new part. My first major task was to decide on a camera perspective. I could do an overhead view or some isometric angle. I started by deciding how I’d like to see Glace move around in the overworld, That lead me to creating some animations, and before I knew it I’d decided on the following. So I’m going with an isometric view. I went ahead and added support for eight directions of movement. Well, eight animated directions - you can move any direction with an analog stick. I just got this working a few minutes ago so things are looking a little unpolished, but it’s a good stopping point for today. The ground here is actually 3D - something I threw together to help with testing perspective, but I don’t plan on keeping it like this. It’ll be a 2D tile map I think. I also zoomed in quite a bit to make the GIF. Glace will be pretty small on the map in the actual game. I want to have lots of screen space for the world. So in the Glace remake, you’ll explore and find stages on the overworld map. Some stages are locked or behind obstacles depending on where you are in the story. You can’t just run to the last stage of the game right away. We’ll still have the same “zones” from the original. That is the grassy, swamp, mountain, and lab. These are all connected in the overworld. I have a few extra game play mechanics planned that involve the overworld. Originally I had planned on doing the overworld in a Glace sequel, but I feel like it can really boost the potential of the original, so here we are. If the Glace remake sells I can build on top of this for part 2. What’s next? Fixing up the animations a bit and getting started on the overworld tile map! Thanks for reading. Nothing too glamorous to show today. I’ve worked on the new gate stones a bit - mainly the little UI that pops up when you’re near them. Gate stones act like check points within a level. If you die you’ll fly back to the last one you touched. They also act as exit and entry points. You can’t see it yet, but when you activate them, a menu pops up so you can do a few things - notably exit the level and go to the overworld. When you come back to the same level, you’ll come in at the same gate stone. The button is turning orange because I’m pressing it on the controller. I’m going to use this same kind of pop up UI for anything in the game that’s activatable. Things like doors and… other things. Like most other things in the new Glace, gate stones are lit by a directional light and a normal map. What you see in the GIF is the combination of the two following textures. Also I hooked up Rewired today. Rewired is an incredibly well-designed input component. I’m blown away by its quality. Not an ad. But man I love it. More gate stone work tomorrow! Hi folks - I put together a quick game play video for you. If you played the original you’ll notice Glace still runs about the same speed and jumps about the same height. He still throws little magic beads that fly out and boomerang back. You can still bounce around like the dickens. You’ll maybe notice some new things too that I’ve mentioned in previous posts. Glace has some more control over beads. You can freeze them in place and zip that back to you at high speed. This is an experimental thing but I’m liking it a bunch. The bead slashes back in a straight line, ignoring walls and damaging anything that gets in the way. Another experimental thing you might notice in the video: when you grab a bead that’s zipping back to you, it shoots you off a bit in the direction the bead was traveling. It’s sort of like catching a heavy ball that stumbles you back. Glace can use this effect to do sneaky things, like shooting himself up in the air or getting a burst of running speed. Do you have any thoughts on this? Cool mobility feature? Too much? One other thing I like about the bead return feature is it lets you grab a bead back that might have flown off in an unhelpful direction. By the way I have something planned for combing beads together. Throw a bead, freeze it, then throw a second bead at the frozen one. Something happens. Moving on, as I mentioned in another post, enemies don’t hurt you by just touching you. They have to hit you with an attack. You can see the squish monsters performing two kinds of attacks in the video. I manage not to get hit. I might have had damage turned off. I forget. You’ll see the squishes jumping off ledges. I rewired the AI component the other week and haven’t told them to not do that yet. Magic sparkles! Enemies burst into pretty stars on death. I reproduced this from the original game. What do you think? Should we keep this? The video also shows that Glace can dash around. I just covered this so won’t go into detail, but I really like this feature so far. The music in the video is by Zach, the original composer! The video cuts off right before the music picks up. Sorry about that. Zach hangs out in our Discord server and sometimes hooks his keyboard up so we can listen in on the process. Pretty cool. Anyway if you liked this video I’d really appreciate it if you’d share it and let your friends know about the game. Only 76 days left in my 100 day Glace coding challenge! Next up, I’m working on the gate stones that Glace uses to move around the world. Cheers! In the original Glace game from 2004, Glace could bounce if you held the up button after falling from some height. He’d also bounce off walls if you hit them fast enough. I thought this was generally pretty fun but I’m rethinking a few parts of it. One difference in the new game is that Glace won’t bounce off walls unless a button is held down. This should stop folks from accidentally triggering the horizontal bounce just by running fast. Some other major differences are the new air dash and ground slam that you can see in the animation. In the new Glace game, players can jump in the air and then dash a short distance. It’s kind of like a double jump but you can fly in any direction instead of just jumping up. This started out as an experiment but it didn’t take long before I really fell in love with the extra mobility. The control of Glace just seems more lively now. It’ll need some more tweaking and testing but I’m excited to see what players think of it. As you can maybe tell by the gratuitous screen shake, Glace can slam the ground if he dashes straight down. You can use this to damage and sometimes stun nearby enemies. I just added this in today and so far I love it. To shake the camera, I used the same shake/wobble logic that I showed in a previous post. I like the sine-wave shake better than the way I used to shake the screen. In the old Glace I just added random values to the camera position for a quarter second before returning it to its original position. I swapped out the enemy alert indicator too. In this previous post you can see the monster flash orange before attacking. I decided to go with the tried-and-true exclamation point instead. Another thing about air dashing is you can use it to bounce off horizontal walls quickly without having to get a long running start. Thanks for reading. Let me know if you have any thoughts. My physics/collision side quest didn’t go so great. I’m going to put the new component down for now. I could spend another week on it at least before getting it right - and there’s just so much more to get done for the new Glace. So it’s back to my previous physics component for now. All is not lost though. I learned a few new things a long the way. I didn’t have a good intuitive grasp of the dot product operation until recently. Now I understand that it basically tells us how similar two vectors are. It turns out this is really useful. For two normalized vectors that point the same direction, the result is 1. If they point the opposite directions their result is -1. As two vectors become perpendicular, their result approaches zero. We can use this to determine how an object should bounce off a surface given the object’s velocity and the normal of the surface. We can also use it to simulate the difficulty of walking up steep inclines or the ease of walking down a slope. Very cool. I drew a few new tiles for the grassy meadows tile map this morning. These are roof shingles to add to the tops of some buildings. Here’s a quick screen grab from Photoshop. Cheers! Hi friends. I've been busy rewriting the physics component in Glace. The system I had before worked alright, but it was getting a little complicated as I added more features to the game. Basically I need something that uses less tricks and special states. Glace doesn't use Unity's built-in physics engine. From what I've gathered, it's common for Unity platformers to forego the built-in engine in favor of a raycast-based solution. The reasoning here is even though the built-in physics engine is great, it's really difficult to make it behave as intended for a 2D platformer game. It just wasn't meant to do it. So back to raycasting. That's how Glace handles physics. Before an object is moved in the world, its shape is cast out in the direction of travel. If the cast doesn't hit anything, the object moves to its destination. If the raycast hits something, well, it's complicated. At least for me. My old system was cobbled together from various sources on the net, including the super cool Corgi Engine I grabbed from the Asset Store. The Corgi Engine is a great asset that I'd recommend to anyone who’s trying to get a handle on platformers for Unity. It uses a collision detection method a little similar to what I did in the original Glace. That is, when you move an object, you do it one dimension at a time. First on the x-axis, then on the y, with each dimension having its own ray cast. So for a vector (2, 3), you'd first raycast and move 2 along the x-axis, then raycast and move 3 along the y-axis. If youd been at the origin prior, now you'd be at (2, 3). That is, assuming you didn't hit something with those raycasts. So why perform two separate raycasts instead of just a single cast along the movement vector? One reason: it can give you an idea of what to do with a collision. If you hit something on the x phase of the movement, you know you hit something moving horizontally. You don't have to do any other calculations to know this. Same goes for the y check. Folks will use this to determine whether or not an object is "grounded" (standing on a horizontal surface). If you’re moving an object down during the y phase and you collide with something, you know you hit the ground. If you hit something while moving up you know your character just bumped his head on the ceiling. You get all this without doing any complicated stuff. In the original Glace where I only did overlap tests (no raycasts), it was the ONLY way I knew how to tell if Glace should bounce left/right off a wall or up/down off the ground. A drawback to the "x then y" method is that it doesn't handle non-right angle surfaces well. If you want slopes in your game, there are some extra tricks you need to manage. This is where things start getting weird and where, in my opinion, the method just breaks down. The Corgi Engine has a pretty nice way of handling these extra tricks, but for me its just too much state to worry about when combined with other things I’m doing. I want to find a different way. I don't even know if I want slopes in the new Glace. Would it be cool? I mean yea. But would slopes actually make the game more fun to play? I guess I don't know. One thing's for sure though, it'd be nice to try it out. Anyway, this is what I've been doing! I have a system that I'm pretty happy with. It casts the x and y as a single vector and uses the normals of hit surfaces to determine how to position the object post collision(s). I'll post details on it next! Here’s a shot of the physics system handling an object that moved (500, 0) in a single frame. You can see it being redirected around until it ran out of juice. Monsters can have different kinds of attacks and they decide what attack to use based on the circumstance. Attacks have some kind of “tell” so players who pay attention can know what’s coming. The simplest enemy in the original game is the Squish. He walked back and forth with no player sensing ability at all. He’d detect walls and cliffs with rectangle intersect tests and flip direction if needed. If the player touches the Squish then the player receives damage. Actually if the player touched any of the enemies they’d receive damage. That was easy to do but I didn’t really like how it turned out in the end. It was easy to program pretty challenging AI because the enemy would just have to run around and the player would have to make sure never to touch them. Some enemies enemies would shoot stuff at the player too but that was just more touch-based damage. In the new Glace damage will work a little differently. Enemies this time around have actual attacks, outside of just trying to occupy the same spot as the player. In fact Glace won’t be damaged by just touching an enemy. The enemy needs to perform some kind of attack and that attack has to connect for damage to happen. If you’ve played many games you can probably see why this is more interesting. It’s true that it takes more work for this kind of setup, but it’s worth it in my opinion. There were a few cases in the original game where it was downright annoying for enemies to damage you upon just a touch. Not only does it hurt you, but it totally slows your roll. Glace likes to move fast and that means there’s not a lot of time to react to an unexpected enemy moving within view. You’d hit the enemy and be stunned for a second (which is also a little annoying), and then you’d have to get back up to speed and get on with your business. Another pain point is when Glace jumps down onto a lower platform, he’ll sometimes fall on top of an enemy that was pretty much impossible to avoid. Cue the stun. No likey. With this new way of handling damage, Glace would jump down onto the platform and not be immediately damaged. The player would potentially have a chance to respond to the situation. The enemies would be just as surprised as you as they decide what kind of attack to deploy. Come to think of it that stun mode that Glace enters after being damaged is super annoying. The way I look at it now is that taking control away from the player, even for a second, should be kind of a big deal. Maybe there’s a stun affect that certain enemies can inflict but it shouldn’t just be handed out all willy nilly. I think I’ll look into changing that for the new edition. Probably go with zero stun time and not have the player knocked back much or at all. Like I said there could be certain powerful attacks that would reserve those effects. Lots of work to do! Thanks for reading. The classic Glace game had some cool things going for it, but one common complaint is that some stages were just too long. Since the original game didn’t have any mid-level save points, players could lose a lot of progress by making a mistake near the end of a stage. This is getting fixed in the new edition. Placed throughout the new stages are marker stones, which save progress automatically as players pass by. These stones also serve as entry/exit points. Players can leave a stage at these markers and reappear back at the same marker when they reenter. Where does Glace go when he leaves a stage? Back to the overworld map of course. More details on this a little later. Another complaint about the original is that game stages could get repetitive. I really think there’s a ton of opportunity for improvement here. For the 2004 game, I really only created a handful of level “building blocks”. When I sat down to build a level, I used map tiles, enemies, gems, and that’s mostly it. There’s only so much one can do with these simple tools. But with the new edition comes new building blocks from which to build new stages. There are new obstacles like doors, force fields, and overgrowth blocking the player’s path. There are walls that resist Glace’s bouncing ability. There are ladders and ropes to climb, treasure chests and crates to open, and more than just gems to collect! Was there anything in the original game that you’d like to see change? Let me know! There are doors in the new edition of Glace, and I use the wobble effect to give doors more of a doory feel. They budge a little bit if you hit them with a weapon. Designers call this “door affordance” or doorfordance for short. Most doors in Glace can be smashed open with weapons or a particular fast-moving player. Other doors will need a key of sorts. I’ll use these for some more interesting variation in the stages. Enemies can’t see through them. I’m thinking Glace will get a power that will let him bash doors open and stun any nearby foes. Oooh doors. Speaking of doors, check it out - they’re 3D. Doing it this way ended up being easier than using animated sprites. I think it looks nicer too. I’m pretty sure this is how Dead Cells does their doors and probably lots of other games too. I still use a 2D collider to handle collisions with the door and to block the player while it’s shut. That’s the thin green outline in the shot below. You can also see how the two tile maps are layered. I didn’t get the whole day to dedicate to the Glace project but made some good progress anyway. I made a little tear-off day counter thing to keep my schedule visible. I really, really want to have this game releasable in 96 days. Lots of work to do still! I’ve been experimenting with some new bead attack modes. One thing Glace can do now is make beads zip back to him super fast in a straight line. This causes beads to slash through the air in a line between Glace and wherever the beads was when the attack was triggered. Since the beads move so fast in this case, I can’t rely on overlap tests between colliders. I had to go ahead and add ray cast collision tests for this. I use Physics2D.CircleCastNonAlloc(…) in this case. A bead slash attack cuts through an enemy. The bead moves so fast that ray casts are needed to detect the collisions. Ray casts are used to detect collisions between Glace and the environment as well. In the original game, I only used overlap tests, which would cause Glace to move through walls if he was moving too fast. I had to put a bunch of hacks in place to reduce the chances of this, like minimum time steps, which ended up being a pretty bad idea in practice. It’s nice to know we won’t have to worry about this now. I also imported UniRx today and put it to work. I was so happy to see Rx extensions for Unity!. In the new edition of Glace, players can revisit stages at pretty much anytime during their playthrough. This means the game has to keep track of what happens in each stage so that things aren’t just reset every time the player comes back in. That’s what I’m working on now. I’m using Unity for this new edition, and most stages in the game will exist in their own Unity scene. I plan to add all the collectibles into the stages by hand (mostly). Each time the scene is loaded, all the collectibles are spawned in (e.g. gems). I don’t want players to revisit stages and re-collect the same gems. So when gems are collected in a stage, a record is kept, and the stage will remember to delete that gem the next time the scene is loaded. The same system is used for spawning certain enemies and for keeping track of whether or not a particular door/obstacle has been unlocked. Should be cool! Kicking off a 100 day Glace development challenge. I’ll post how things are going here!